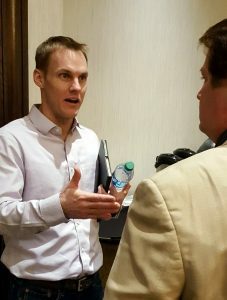 RICHMOND, Va. (BP)—David Platt has announced plans to step down as president of the International Mission Board (IMB) but will continue to serve until a new president is selected. Platt told trustees, missionaries and staff Feb. 12 that during his nearly four-year tenure at the IMB, he has been “burdened to continue preaching and leading in the local church,” which led to assuming a teaching pastor role in 2017 at McLean Bible Church in Northern Va., alongside his leadership of the IMB. The IMB trustee executive committee agreed in August to evaluate Platt’s involvement at McLean during a provisional period, BP reported in September. A presidential search committee will comprise board trustees appointed by trustee chairman Rick Dunbar, member of Madison, Miss., First, according to the IMB release. David Roach is Baptist Press' chief national correspondent. View more articles by David Roach.